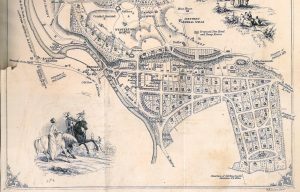 Stirling Council Archives holds building plans submitted to Bridge of Allan Dean of Guild. 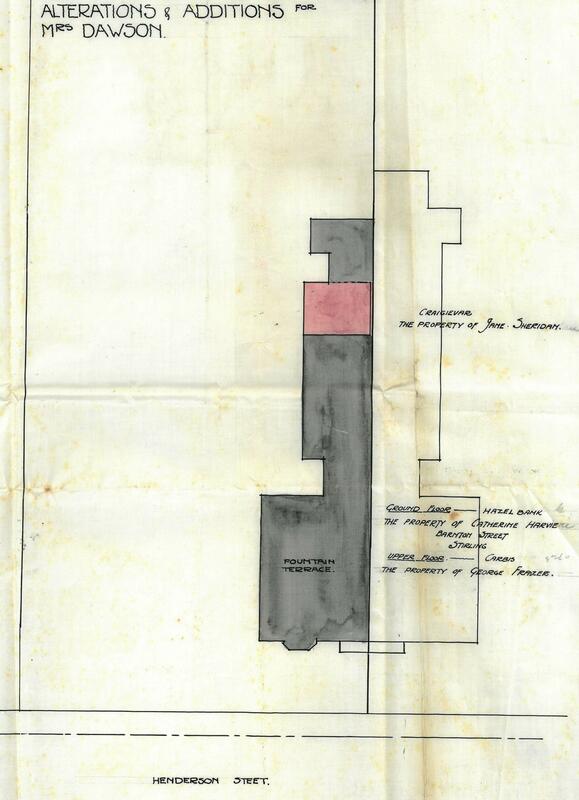 One such plan is for alterations and additions to Fountain Terrace on Henderson Street in 1930. Fountain Terrace is a listed two storey semi-detached villa built in the early Victorian period. 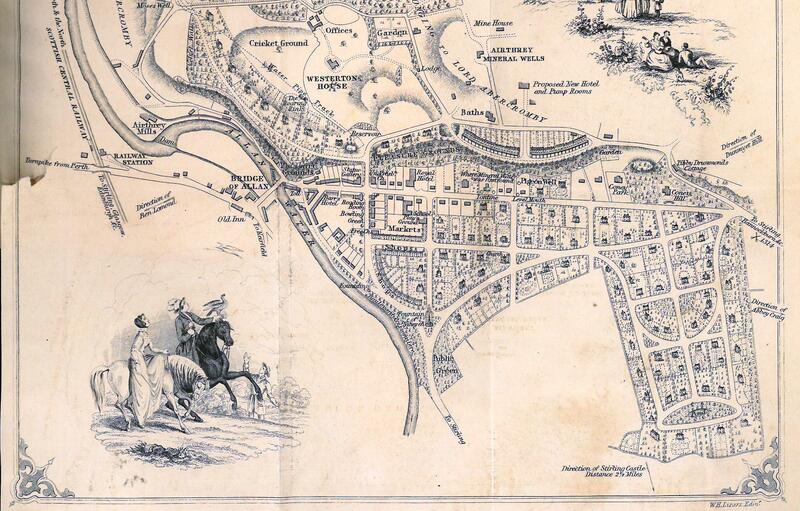 The property can be found on an 1861 6 inch OS map and on an earlier map of proposed development to Bridge of Allan, c.1852. It is unclear how much earlier the property was built. 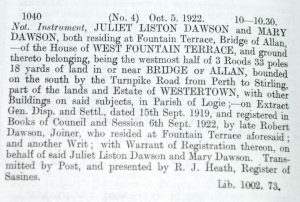 The land originally belonged to the Westertown Estate. 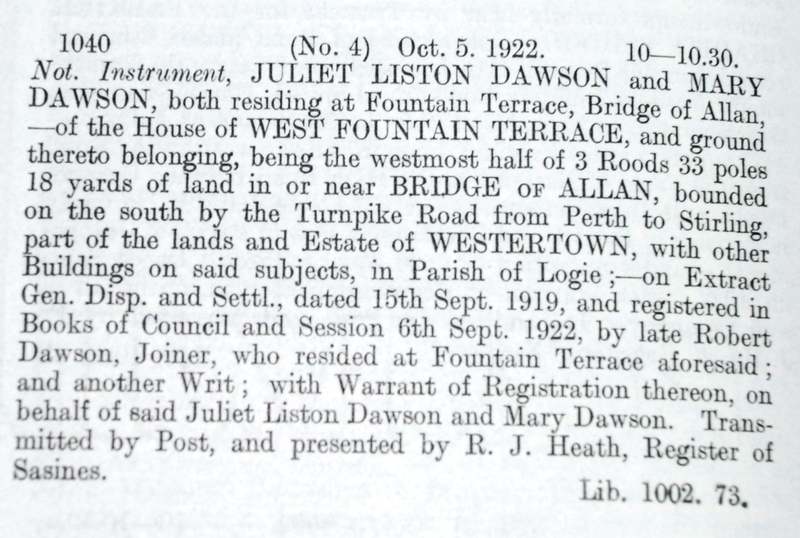 Doctor Alexander Paterson and his wife owned the property from 1857. 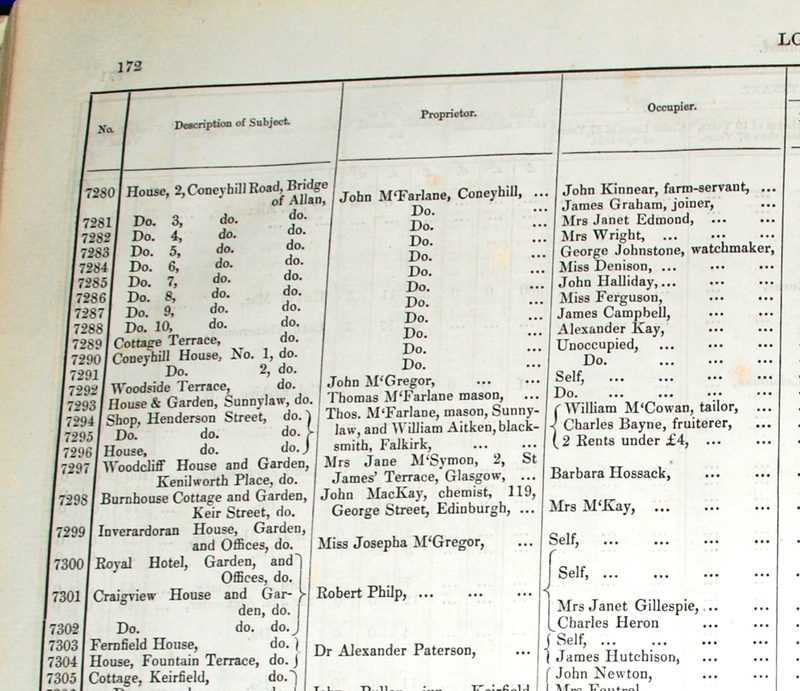 The revered doctor and his family lived in Fernfield House (also on Henderson Street) and leased Fountain Terrace. The Paterson Clock in Bridge of Allan is a memorial to Dr Paterson who died in 1898. 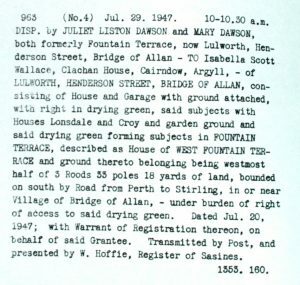 Robert Dawson and his wife Janet (nee Battison) bought West Fountain Terrace in May 1905. Robert was a master joiner and had two daughters, Juliet & Mary, and a son, James. 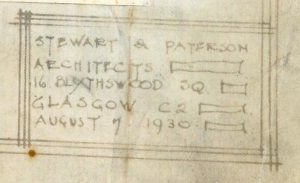 James was a Corporal with the 4th Scottish Rifles and served in the First World War. 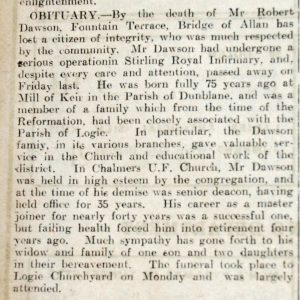 Robert died on 1 Sep 1922, aged 75 years, following an operation at the Royal Infirmary, Stirling. 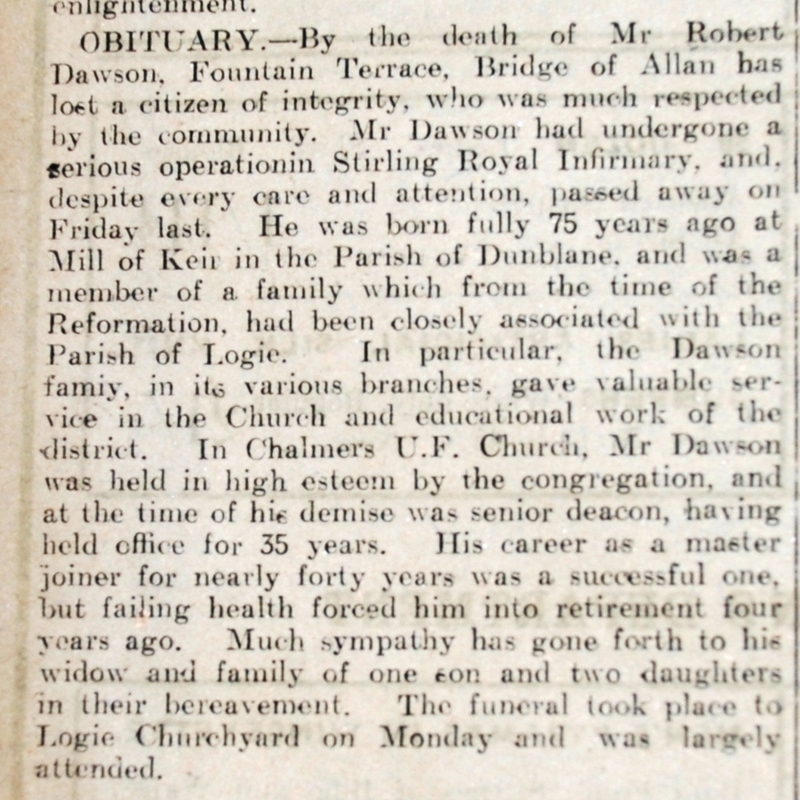 He was buried in Logie Churchyard. 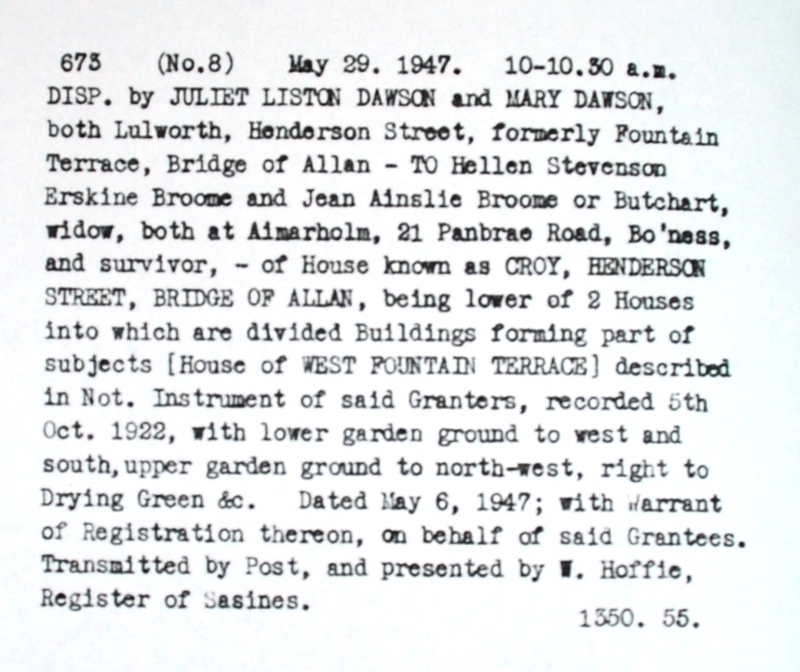 Registers of Sasines records reveal that the property was inherited by his two daughters. 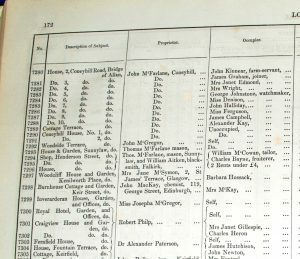 Looking at the valuation rolls, Juliet and Mary are recorded as being lodging-house keepers. They split the property into several houses which were rented out. The daughters rented to various individuals including a dentist, widow, civil servant, hairdresser, banker and accountant. 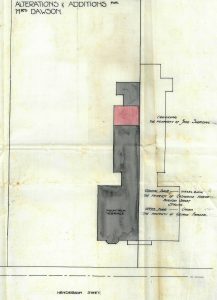 The building plans submitted in 1930 show room layouts. ‘House No. 1’ is at the front of the property on the ground floor. Half-way down the side of the property are stairs up to ‘House No.2’ which is directly above ‘House No.1’. These houses both have two bedrooms, bay-windowed sitting room facing onto Henderson Street, kitchen and a bathroom. The front facing bedrooms have French windows leading onto a verandah on the upper floor. The third and largest house is spread over two floors at the rear of the building. The entrance hall leads one way to a dining room and bedroom. Or the other way to the kitchen, coal storage, garage and wash space. Upstairs are two bedrooms (one appears to be a proposed extension to the building), sitting room and bathroom. The plans reveal details such as the new entrance to ‘House No.1’ was previously a window, new wood floors are to be added in some rooms, and the upper half of part of the dining room wall is to be glass. 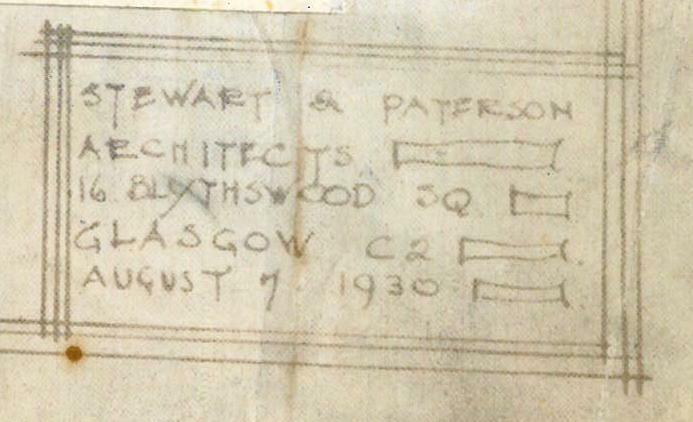 The architects who drew up the plans were Stewart & Paterson, 16 Blythswood Square, Glasgow. Following WWII the Dawsons sold the houses within Fountain Terrace, including their own home, Lulworth. 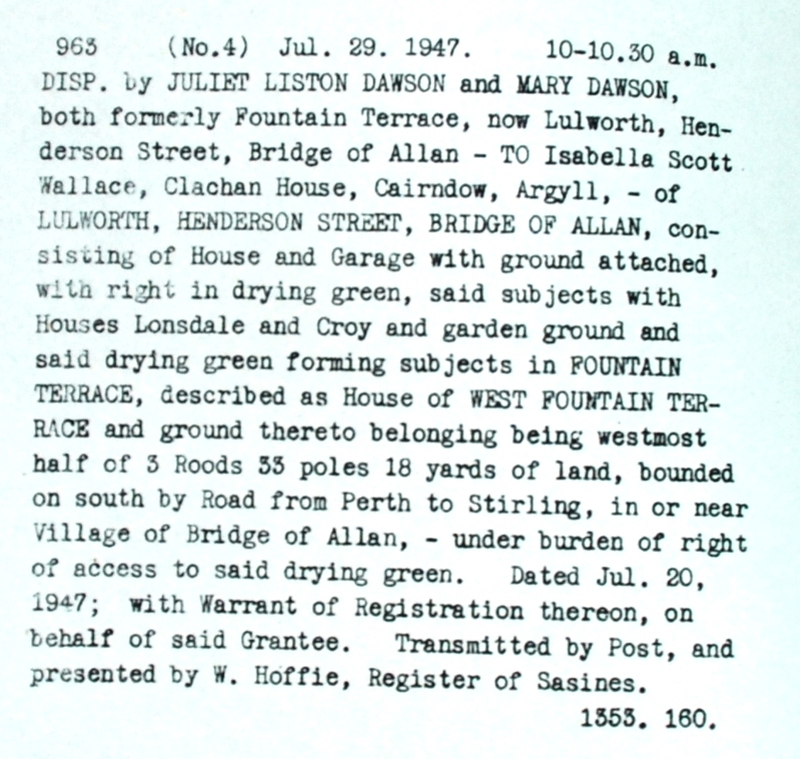 Fountain Terrace has changed names numerous times. As a single property it has also been known as West Fountain Terrace or Lulworth. 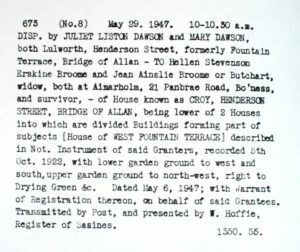 The individual rented houses have had names including Kirkwood, Croy, Lonsdale and Netherlea.